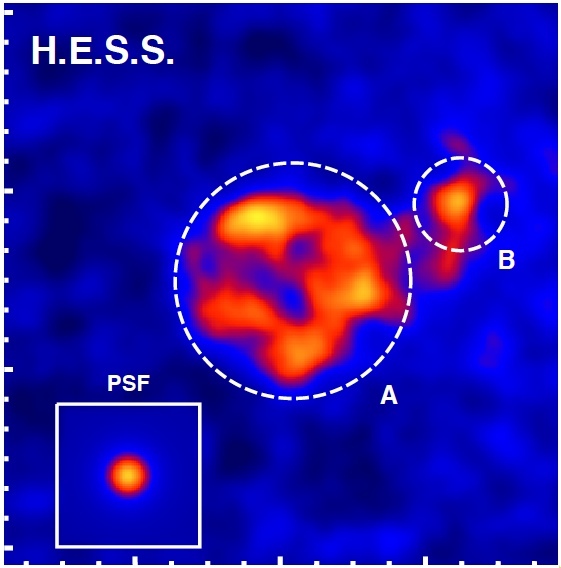 New very high energy gamma-ray image of HESS J1731-347, resolving a shell coincident with the radio shell G356.6-0.7 (region A). Outside the shell, a gamma-ray excess of 7.5 sigma significance is seen (region B). The inset illustrates the H.E.S.S. angular resolution for this data set, i.e. how a point source of gamma rays would appear. The image covers a 1.5 degr. by 1.5 degr. region. Preliminary. The supernova remnant G356.6-0.7 was the first shell-type remnant discovered on the basis of very high energy gamma-ray observations: When following up on the discovery of the extended gamma-ray source HESS J1731-347 (Aharonian et al. 2008), Tian et al. 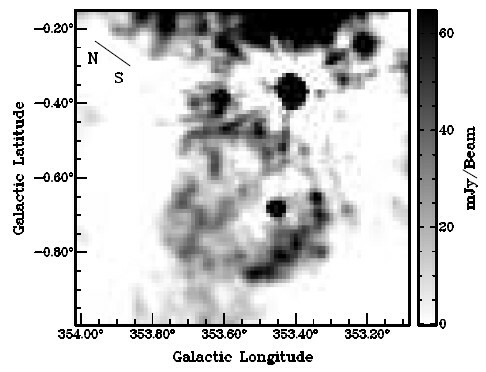 (2008) discovered in radio data clear indications for a supernova shell of about 0.4 degrees in diameter (Fig. 1), see SOM 2009/03. With this diameter, the shell is large enough to be resolvable in very high energy gamma rays, given sufficient event statistics (low statistics in the discovery data set forced strong smoothing of the image, and did not allow to study substructures of the source). This motivated follow-up observations with H.E.S.S., expanding the data set from originally 14 h of observation time to a total of 60 h. In addition applying advanced analysis methods, a shell is now also visible in the H.E.S.S. data (top image), making this the first non-thermal supernova shell discovered based on gamma-ray observations, and now seen in radio, X-rays and gamma-rays. Fig. 2 and Fig. 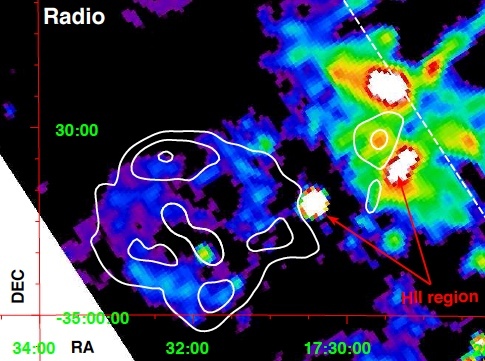 3 illustrate that the gamma-ray image matches the shell seen in radio in size and shape. Tian et al. (2008) estimated the distance to the remnant to 3.2+-0.8 kpc; on the basis of X-ray absorption data and CO observations, the H.E.S.S. analysis now finds 3.2 kpc rather as a lower limit for the distance, implying a shell diameter of at least 30 pc. At this distance, the gamma-ray luminosity of HESS J1731-347 is slightly larger than that of RX J1713.7-3946, making this the most luminous very high energy gamma-ray shell. Details on the X-ray and CO data and on the interpretation in terms of electron or proton acceleration in the remnant shock will be presented in a forthcoming paper. Fig. 1: Discovery radio image at 1.4 GHz of the region of HESS J1731-347. (Note that this image is in Galactic coordinates, whereas the top image and the following image are in Ra-Dec coordinates.) From Tian et al. (2008). Fig. 2: 1.4 GHz radio image, with the contours of very high energy gamma-ray emission superimposed in white. The dashed line indicates the Galactic plane. Fig. 3: The radial profile of the remnant in gamma rays (green points) and in radio (red squares). 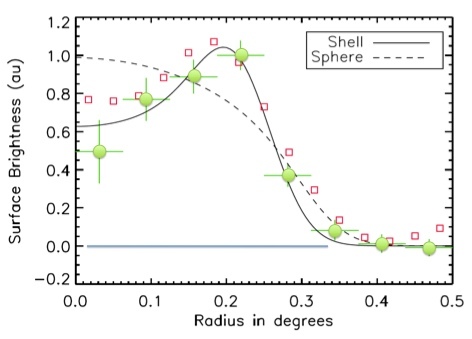 Overlaid are the distributions expected for a shell (full line) and a filled sphere (dashed) as emission volumes, with parameters fit to the gamma ray data taking the angular resolution of the instrument into account. For the shell model, the best fit radius is 0.27+-0.02 degr., and an upper limit of the shell thickness is 0.12 degrees. Preliminary.